This past weekend was Canadian Thanksgiving, and as per usual I was in charge of the ever important desserts for not just one, but two dinners. What can I say, I’ve been type-cast when it comes to family/holiday dinners. One day, when I have a place that can comfortably seat more than 2 people, I will have to host my own family dinner so I can experiment with all of the savoury main and side dishes. But until then, I’m okay with my Dessert Queen status. The question then was – what was I going to make? I obviously couldn’t make the same thing for both dinners (boring! ), and I had already been advised that there was going to be pumpkin pie at each of the dinners, so pumpkin anything was out. I figured I needed to make a cheesecake, because I always make at least one cheesecake. I decided to go with a delicious Autumn Cheesecake featuring apples, cinnamon, and walnuts for my family’s dinner. But I was still at a loss as to what to make for dinner with the boyfriend’s family. I first thought about making some sort of layer cake – maybe chocolate, maybe carrot cake. Then I realized I don’t own any cake pans (fail), and had no container to transport said cake to its destination. There was no time to sort out those logistical issues, so I decided upon cupcakes. I know, not exactly a fancy holiday dessert, but hey, who doesn’t like a cupcake? Then I was faced with another dilemma – what flavour should they be? 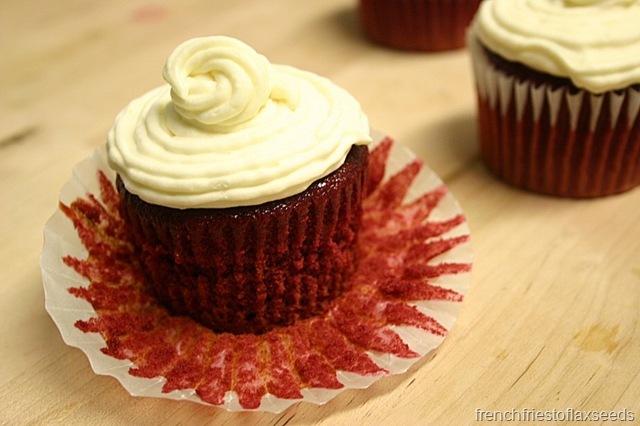 I don’t know why, but one evening red velvet cupcakes popped into my mind. I’ve had red velvet cake a couple of times, but never made it before. 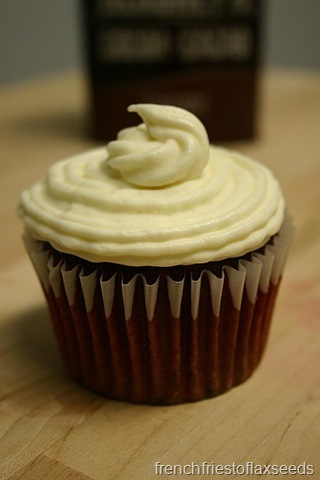 I knew that most red velvet cakes are made with a vat of red food colouring, which I really wanted to avoid. So I set out doing some red velvet research in order to avoid using any food colouring, but still achieving a vibrant red colour. Traditional red velvet gets its red colour from a chemical reaction between the cocoa powder and the acidic ingredients in the batter. I don’t know if that makes the cake a vibrant red, but it definitely lends it a red hue. I then discovered that you can use beets to achieve a bright red colour – perfect! Add in some vegetables and avoid food colouring? I’m all for it. I found plenty of recipes online that utilized beets, natural cocoa, and various acidic ingredients. I used these two recipes to base my own off of. 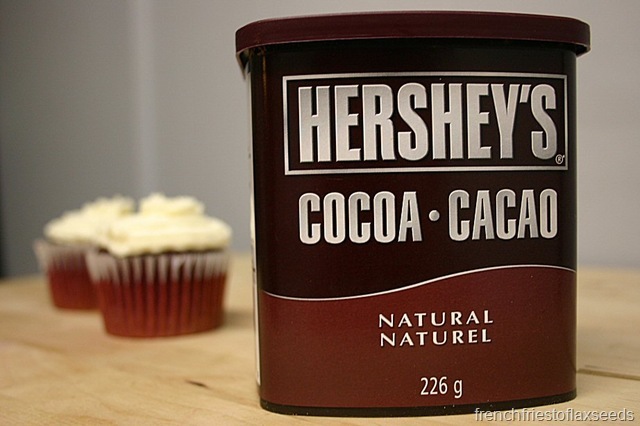 The only natural cocoa I could find was Hershey’s – even the organic Cocoa Camino was alkalized. 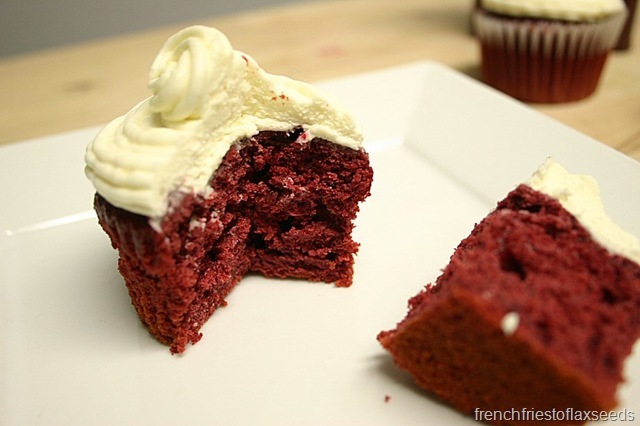 Red velvet cakes are all about the acid – without it, you’ll end up with a purple or brown hued cake. I needed a rich, creamy icing to go with my cupcakes, and turned to my favourite white chocolate cream cheese icing from my favourite carrot cake recipe (courtesy of Rebar Modern Cuisine). 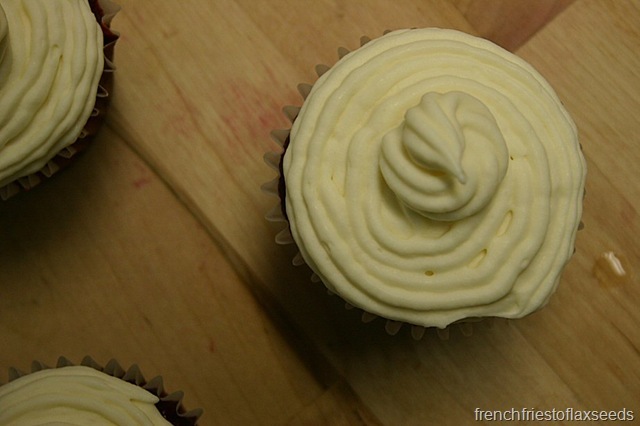 I even bought a cheap piping bag to make them look fancy – too bad I broke it when I went to clean it. The lighting in my kitchen doesn’t do the colour of these cupcake justice – they were a lovely deep red hue. I was so happy they turned out without having to resort to artificial colours. 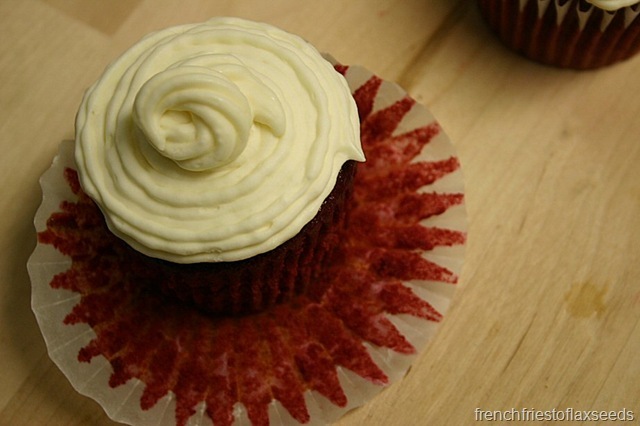 And you cannot taste any hint of beet in the cupcakes. They were moist, with a hint of chocolate and a nice even crumb. The icing was, well, the icing on the cake. 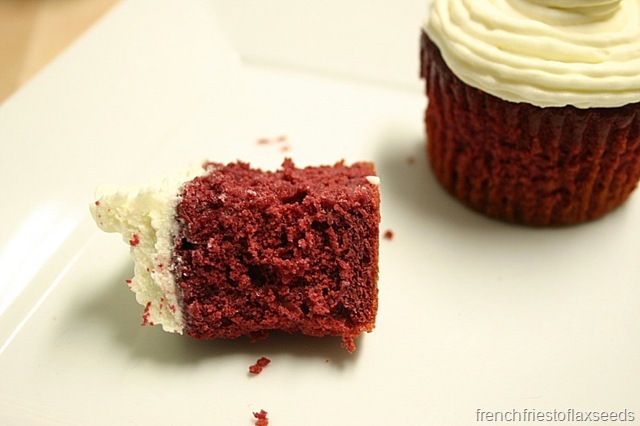 Love red velvet cake but hate all that artificial colouring? 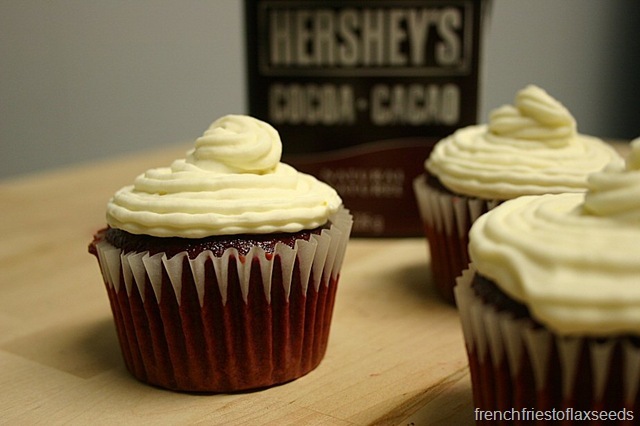 Now you can make your own red velvet cake “au naturel” with beets, natural cocoa powder, and a few acidic ingredients. 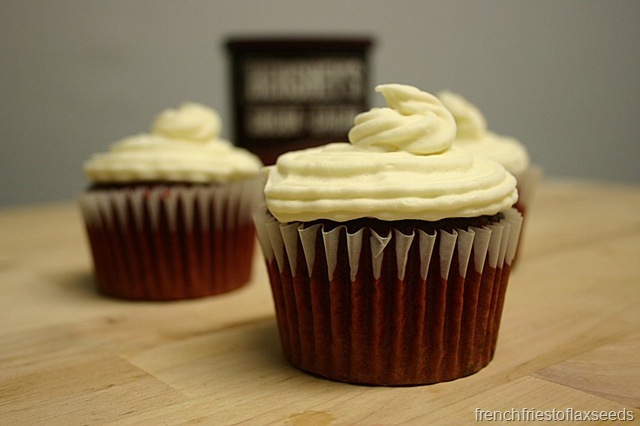 Topped with a rich white chocolate cream cheese frosting, these will be a hit with your friends, family, coworkers, or whoever else you might want to share them with. Preheat oven to 350 degrees F. Place paper liners in muffin tin cups. In a food processor, add beet pureé, sugar, eggs, butter, buttermilk, lemon juice, vinegar, and vanilla. Pulse until completely combined. In a medium bowl, mix flour, cocoa powder, baking powder, and salt until evenly mixed. Add dry ingredient to food processor, and pulse until batter is smooth. Fill liners 2/3 full of batter. Bake for 18 min, or until the cake springs back when touched. Remove from muffin tin, and cool on wire rack. Beat cream cheese on high until smooth and fluffy. Add vanilla and butter, and lightly blend. Melt white chocolate over double boiler, then add to cream cheese mixture. Blend until smooth and fluffy. Slowly add icing sugar until well incorporated and icing is light and fluffy. Notes: To make beet pureé, roast, boil, or steam peeled beets until fork tender. Add to food processor and blend until smooth, adding water as needed to keep the mixture moving. Measure out 3/4 of a cup, and save the rest for another use. Don’t bother cleaning the food processor as the cake batter is mixed right inside! Also, make sure to use baking powder, not baking soda, as the soda is more alkaline and will turn the cake purple or brown. 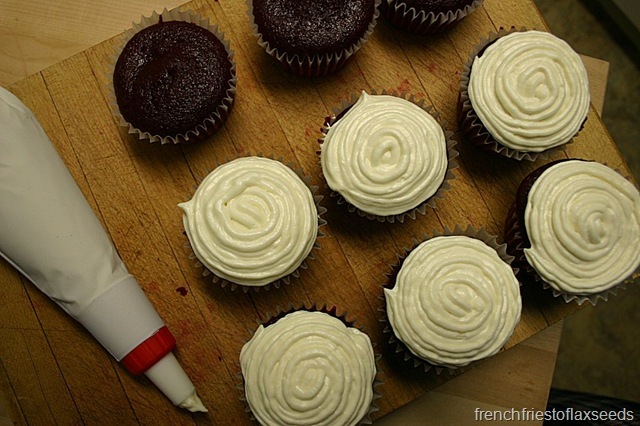 Cake or cupcakes – which do you prefer?